Alexander Beachfront Apartments is an ideal place to unwind, relax, recharge the batteries and enjoy one of Australia's best holiday destinations. This prime beachfront security complex provides visitors to Hervey Bay with comfortable fully self contained accommodation. 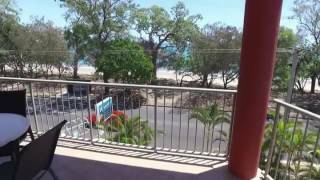 There are three floors of spacious two bedroom apartments each with fully equipped kitchen, laundry, reverse air conditioning, Foxtel, Wi-Fi, large private balconies with lovely beach views, security car park with lift to all levels and swimming pool. Opposite popular Shelly beach at the quiet end of the Esplanade with handy access to restaurants, clubs and all attractions. They have an on site tour desk with local material/information available for all their guests. Each beach front apartment is complete with full kitchen and laundry facilities, dishwasher, microwave, television, Foxtel, Wi-fi, separate bath and shower. Enjoy the breathtaking 45 degree views from your own large private balcony. Each apartment complete with full kitchen and laundry facilities, dishwasher, microwave, television, free Foxtel, Wi-fi,bath and shower. Enjoy the breathtaking 45 degree views from your own large private balcony. The top floor apartments offer access to private roof top entertainment areas with magnificent views across the Bay to World Heritage Listed Fraser Island. Each rooftop area has a barbecue and is furnished with table, chairs and sun lounges. The beach front top floor apartment offers private access to roof top entertainment areas with magnificent views across the Bay to World Heritage Listed Fraser Island. The rooftop area has a barbecue and is furnished with table, chairs and sun lounges.